LONDON, 21 MARCH 2019. Despite positive performance of main stock indices and a decrease of volatility in many markets, ongoing geopolitical uncertainties and trade issues continue to dampen investor enthusiasm, resulting in the number of IPOs in the first three months of 2019 (YTD 2019) falling to 199 globally and US$13.1b in proceeds. Direct: +44 20 7951 8993 | Media relations and social media leader. African water charity trustee. Frustrated England cricket and Liverpool football fan. Part-time skiier. Full-time dad. 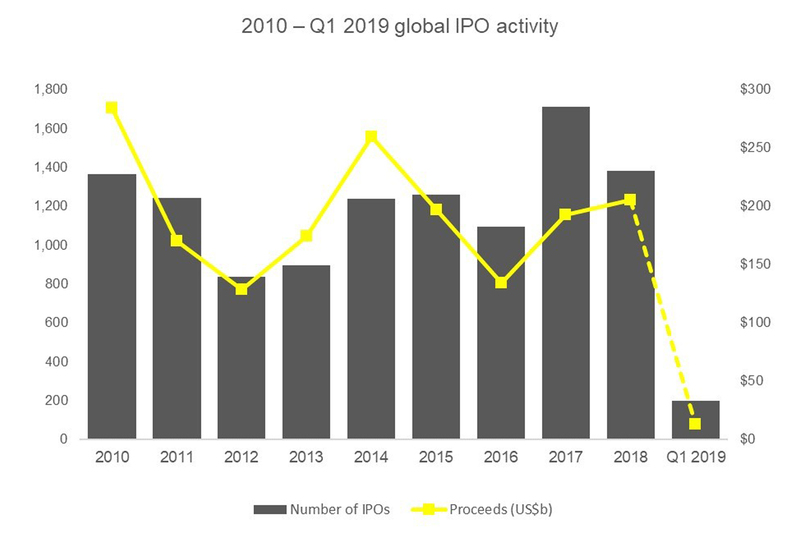 Despite positive performance of main stock indices and a decrease of volatility in many markets, ongoing geopolitical uncertainties and trade issues continue to dampen investor enthusiasm, resulting in the number of IPOs in the first three months of 2019 (YTD 2019) falling to 199 globally and US$13.1b in proceeds. This is a 41% decrease in deals and a 74% decrease in proceeds from YTD 2018. The technology, health care and industrials sectors were the most prolific producers of IPOs globally in YTD 2019, together accounting for 101 IPOs (51% of global IPO by deal numbers) and raising US$5.4b altogether (42% of global proceeds). By proceeds, technology was the strongest sector with US$2.1b raised (16% of global proceeds). These and other findings were published today in the EY quarterly report, Global IPO trends: Q1 2019. The US accounted for 65% of Americas’ IPOs (20) and 92% by proceeds (US$3.0b). However, in the US, market volatility caused foreign issuers to choose to postpone their listings. Only four cross-border IPOs listed in the US in Q1 2019, in comparison with 15 companies in Q1 2018. The NASDAQ ranked second among the top exchange by proceeds globally in YTD 2019, raising US$2.5b or 19.1% of global proceeds, while Canada’s Toronto Main Market and Venture Exchange saw 5 IPOs, which raised US$188m in Q1 2019, and Chile raised $69m via a real estate IPO. Japan continued to demonstrate strength in its IPO markets with Q1 2019 numbers exceeding those from Q1 2018 (23 IPOs in Q1 2019 versus 18 IPOs in Q1 2018). Further, Japan’s exchanges (Tokyo, MOTHERS and JASDAQ) ranked number two among the top 10 exchanges by volume. EMEIA’s two largest IPOs in Q1 2019 came from India’s National Stock Exchange, accounting for 94% of India’s IPO proceeds and 66% of EMEIA’s proceeds for Q1 2019. However, a liquidity crisis among non-bank lenders caused a correction in the Indian stock market in Q4 2018, which has continued to impact Q1 2019 IPO activity. Cross-border IPO activity in Q1 2019 remained at 2018 levels, accounting for 9% of EMEIA companies’ IPO activity.